I just love baking with (and eating) fresh raspberries. Raspberry sweet rolls, chocolate chip raspberry banana bread, and raspberry bundt cake are a few more of my favorites! I am a huge fan of raspberries. I could eat them by the bowl full. We eat them so fast at my house that they don’t often make it into my baked goods. 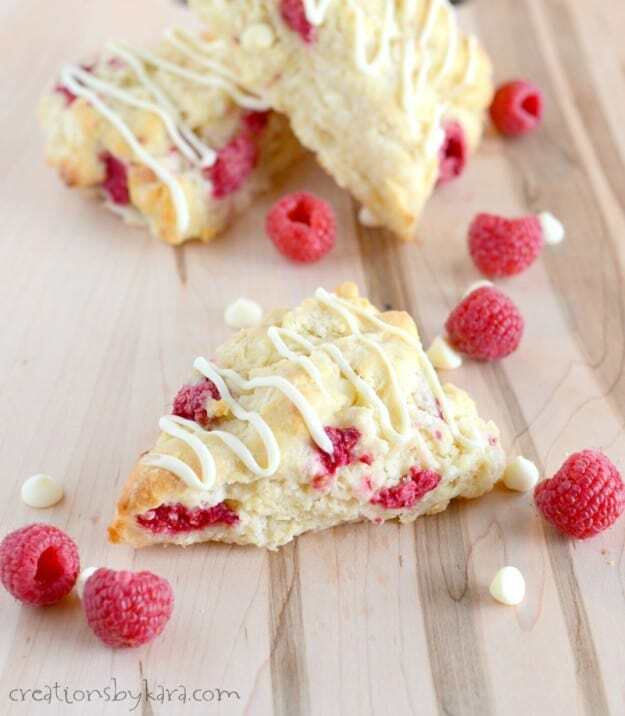 But I had been wanting to try raspberry scones for ages, so this time I came up with a plan. I whipped up a batch as soon as I got home from the grocery store — before anyone even knew we had raspberries. Sometimes you gotta be sneaky! We loved the combination of the tartness of the raspberries with the sweetness of the white chocolate. And of course the scones are nice and buttery. I adore the flavor from the almond extract, it is a perfect compliment to the raspberries. You can of course use vanilla instead, but the flavor won’t be quite the same. Either way though, these scones are just amazing!! If you’ve never made scones before, don’t be scared. They are seriously so easy to make. As long as you don’t overwork the dough, they turn out great. Don’t be intimidated by the process of cutting in the butter. A good quality pastry cutter makes it easier, but if you don’t have one, you can just use a grater to grate in the butter. Either method will produce great results! Whisk together the dry ingredients in a large bowl, then cut or grate in the butter. Stir in some white chocolate chips. In a separate bowl, whisk together the wet ingredients. Add to the flour mixture and mix very gently. Carefully fold in the fresh raspberries. Can raspberry scones be made ahead? Yes, they can! After you cut the dough, you can place the unbaked scones on a single layer and freeze for about 1 1/2 hours. Then remove the frozen dough scones and place in airtight containers. You can bake them frozen, you just need to add more baking time. It may take up to 30 minutes. You can also bake the scones and freeze them in an airtight container. If you choose this method, I recommend freezing them before you add the melted chocolate. Let them thaw before you drizzle them with glaze. Or you can just omit the glaze, they are plenty tasty without it! 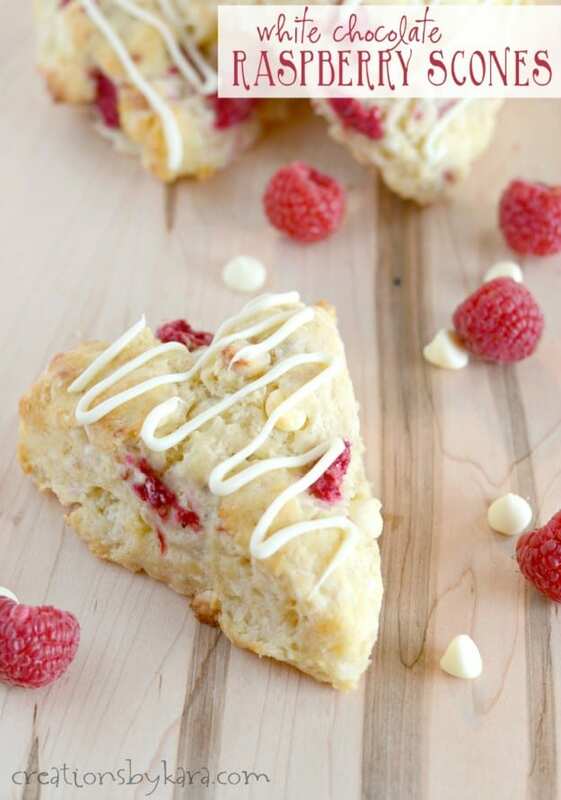 Tender scones bursting with white chocolate chips and raspberries, drizzled with melted white chocolate. Whisk together flour, sugar, baking powder, and salt in a large mixing bowl. Cut in the butter with a pastry cutter, or use a grater to grate it in. Stir in the 1 cup of white chips. In a small bowl, whisk together the milk, cream, eggs, and extracts. Add to the flour mixture and gently stir till barely combined. Carefully fold in the raspberries. If the dough doesn't stick together, you can add a little more milk, but you don't want to add too much. Divide dough in half. Pat each portion into a 7-8" circle on a floured counter top. Cut each into 8 wedges. Place scones on cookie sheets and bake at 400° for 15-20 minutes or till lightly browned. Drizzle with melted white chocolate if desired. To see all my muffin and scone recipes click HERE. I have mad these twice now. Both times they were delicious but not pretty. They completely lost their shape. The last time I even refrigerated them for 30 mins before baking. Still they spread. The dough was pretty wet, is that normal. I love the flavor, I just wish I could fix the shape problem. Any suggestions? I haven’t had that happen with these scones, but I’ve had others that have lost their shape. Usually it’s because the dough is too wet, so you could try using a bit less milk or cream. The dough should stick together, but not be sticky. Good luck! If you have a treenut allergy (like me), replace the almond extract with 1/2 tsp of lemon extract. (1 tsp if you REALLY like lemon flavoring.) It gives a nice hint of sweetness. I just made these with frozen raspberries, I coated them in a little flour and folded them in at the last minute, just a couple folds. They turned out great! No red dough! I should try them with blueberries, I bet they were delicious! 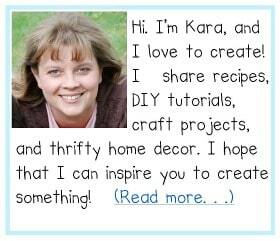 Kara, this sounds so good! Was wondering if it would work with other types of berries? I have had other readers try them with other berries with great results! Should you eat these warm or cold? Ive never made scones before? and if warm can you make them and heat them? Are they as good warmed up, what temperature would you reheat on? I like them warm, so if we have leftovers I just heat them in the microwave for 10-20 seconds. But my kids will just eat them at room temperature. This recipe calls for 1/2 cup cream … whipping cream? I use heavy or whipping cream, but really any type should work. These are delicious! Light and fluffy and delicious! I love the combination of almond extract with vanilla! I will make them again and again!! Thanks for sharing!!! I tried this recipe with frozen raspberries and it was a red mess. What can I do to avoid that next time? Use fresh raspberries. Frozen berries still taste good, but they do make the batter red. Can the scones be frozen? Trying to prepare for lots of out of town visitors for Christmas and my boys love scones. Yes, I freeze scones all the time. You want to make sure and freeze them before adding the white chocolate drizzle. You want to add that just before serving. Hi my name is Benjiman I am 15 I hope to be a navy chef anf uhhh my family LOVED these even though they were my first try . Soo Thanks ! These are the best. I have made them several times. I did add some chopped almonds because I only had 1/4 cup and wanted to store new ones in the jar. Delish. Using blackberries this time. This is the best scone recipe! Oh, I bet blackberries will be fantastic! It really is a good scone recipe, and is easily adapted. So glad you like it! I used black raspberries as well, they turned out so moist and elegant. Love this recipe! I bet that was a yummy twist Sharon! DELICIOUS!!! My kids loved these. thanks for the easy and delicious recipe. All purpose flour or self rising flour? I made them with diced mangos and they came out fantastic. In the process of brainstorming some other flavor combinations. I agree on being mindful of your liquids especially depending on the fruit used. I added some sliced almonds…wow, these are fantastic! These are wonderful. Even my dogs; Angelina and Joli loved them. And they turn down anything that’s not meat. 😂 Now they can join me for High Tea. YES!, or in a pinch, you can use 1/2 & 1/2; However, it won’t be as good if you used the heavy cream. Too, I use, Ghirardelli Premium Baking Bar-White Chocolate. Then, using a sharp knife, chop-it-up, into chunks: some small, some mid-size, some bigger than mid-size. Be sure to also use the “fines”. These are the best scones I have ever made! Be careful with your liquids, the raspberries will add some. Scrumptious! what has happened? I used to print your recipes but this one won’t. Hatd to write it down but I am going to try it tonight with blueberries. I’m not sure why it wouldn’t print Mary. Maybe it was just a glitch. Let me know if you are still having trouble. Does this make a full size or mini scone? Trying to plan for about 30 people for a brunch and mini scones would be ideal. This makes 16 regular sized scones. You can cut them smaller and they will work just fine. They will bake faster, so just make sure you watch them closely! Those scones look delicious!! I love anything with white chocolate!! Same here Kristyn! It’s so yummy in so many things! My boys love scones!! These look incredible and I can’t wait to make them! Pinned! Hope you love them as much as I do Jen! These look so delicious! 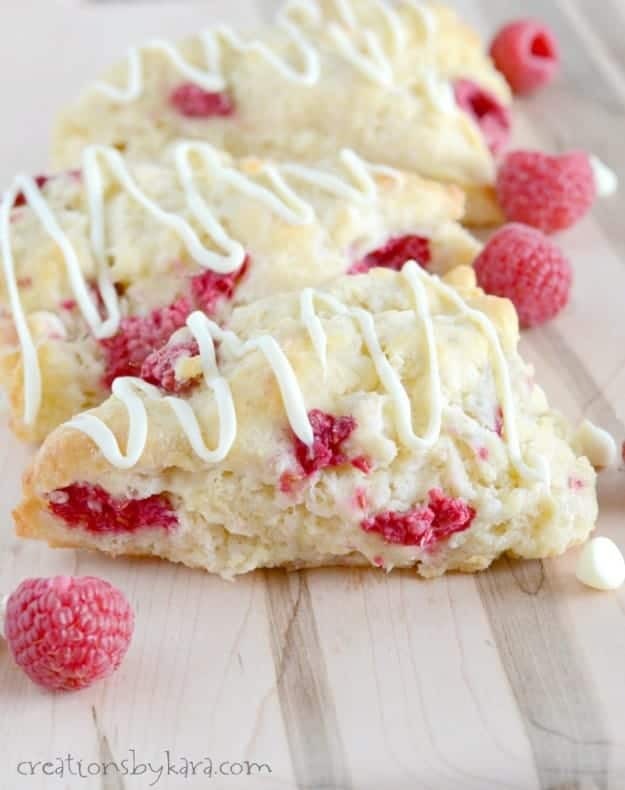 I’ve never had raspberries in scones before, but now I’ve gotta make some! I hadn’t ever tried raspberries before either, but I’ll be making them again for sure. Such a yummy flavor combo!